Ande is our funny, gregarious, naughty, SMART boy. 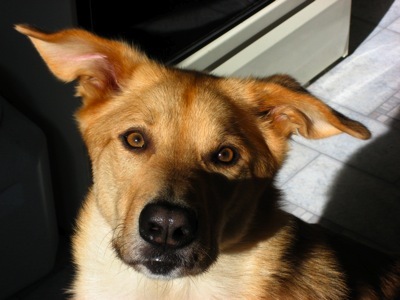 He was our first Chinook, and taught us a lot about dogs, relationships and life in general. His exuberance can’t help but make you laugh. He loves to play, and will do ANTYHING for a treat. He has an extremely strong working drive, excelling at Agility and Rally. His independent spirit and extreme intelligence make him a constant challenge and joy. His outgoing personality, energetic wiggle and enthusiastic kisses make us smile every day. A trainer once told me, as I was more or less despondent about his behavior, that when he was five he would be the best dog I had ever had. He is almost ten, now, still a challenge, but a very, very good dog.